Many of my contemporaries made names for themselves, and good money, shooting for record companies in the nineties. It made sense that I should go that direction too as I started out shooting musicians almost exclusively – but for a number of reasons it didn’t go that way. In retrospect, it’s probably for the best as my friends now complain of sessions made inaccessible or lost by their music clients. These were the days when most color was shot on transparency, so lost is lost. 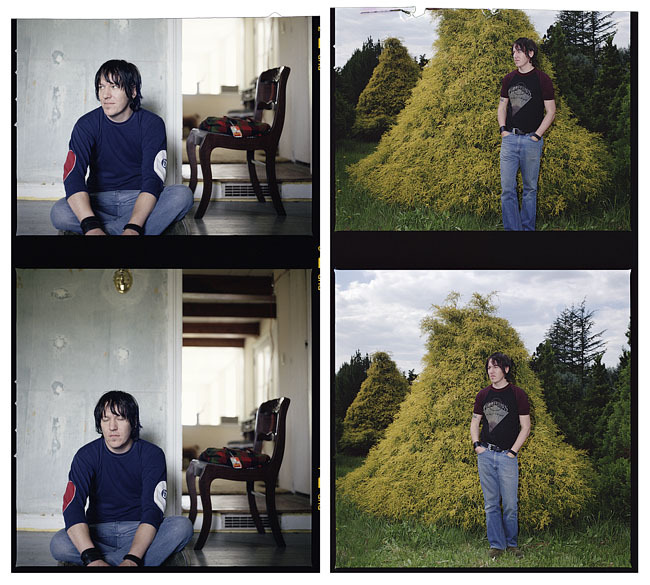 This was the fate of one of my rare music PR shoots, Elliott Smith. I shot him for DreamWorks in 1998, in the run up to his XO album. Elliott was living in Brooklyn at the time and known to be camera-shy the record company recommended that we do the shoot low-key and keep it local for him. But having an editorial background I thought of the images first and my sitter’s comfort second. I had a couple of friends who had just moved to rural New Jersey and together they provided perfect backdrops – one had an old unrenovated farm house and the other an empty in-ground swimming pool. If our subject wasn’t going to give much it wouldn’t matter – the locations were interesting looking. Elliott was pleasant and cooperative but seemed eager to move on and get home (and he made early dinner plans – perhaps revenge for being made to travel to a location) so things were cut short. I thought that the whole session was lost but I came across the four rolls of black-and-white negatives six months ago (and made gorgeous 16×20” contact sheets) and then fell upon the clip tests of the color rolls a couple of weeks ago. Of course, these are not the selects for the session but they’re pretty fun nonetheless – it’s like seeing those rare early-twentieth-century color images that turn up on the Internet once in a while – but the 90s indie-rock version. And it’s nice to see, even in this truncated way, that my visual locations paid off. This entry was posted in Advertising, Behind The Scenes, On Set, Photography, Travel and tagged Chris Buck, Dreamworks, Elliott Smith. Bookmark the permalink. well done! These are beautiful and capture an innocence lost……. elliott sings the soundtrack to my life…. Thankyou so much. Great story and pictures. Its tough to come by quality memorbilia from elliott these days. These are great! I used to have one of those big couches from the first picture and I remember when XO came out, I got one of the promo posters for it, and was wowed to see my couch juxtaposed with my favorite musician. Ha! Thanks for posting, Chris. Great pictures of Elliott – you shot the photo that’s on the cover of the Waltz #2 (XO) single, didn’t you? 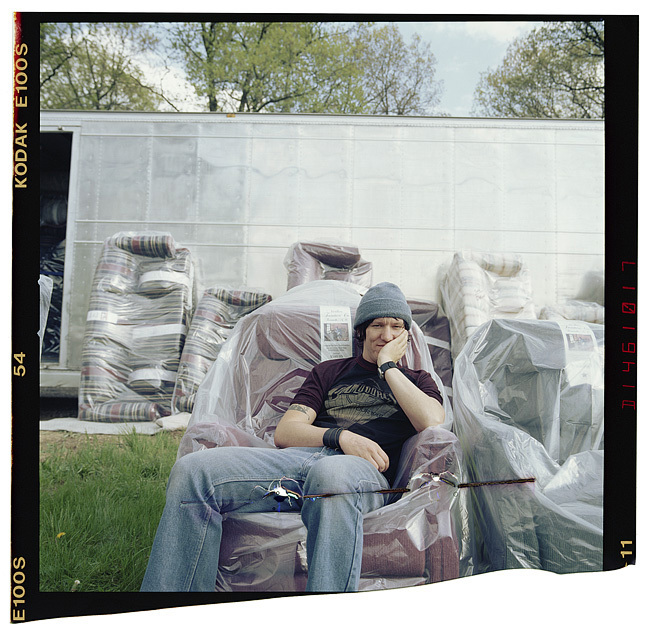 When you mentioned an empty swimming pool I knew that had to be the picture you were talking about – I am an ardent admirer of Elliott Smith and his music, and I have a couple poems I wrote about him on my site – check it out if you get a chance – thanks for sharing the photos! I remember seeing all of your photos from this shoot at a meeting, Dreamworks Records has them! Lucky you to have captured these moments. These are beautiful! You were so lucky to meet him!